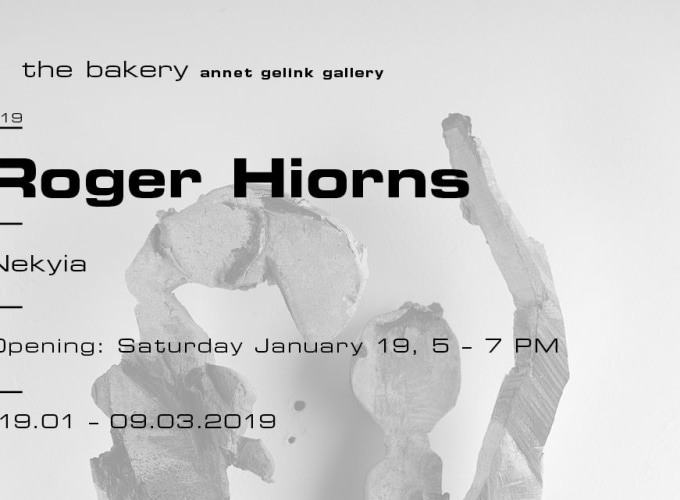 ROGER HIORNS Nekyia January 19 – March 9, 2019 Opening January 19, 5 - 7 pm Annet Gelink Gallery is proud to present a series of works by Roger Hiorns (1975, Birmingham, GB) in The Bakery. On view are several ‘wall works’ made of various materials such as bronze, painted plaster, aluminium, wood and plastic. Hiorns is never too pronounced about the origin of his work - often challenging the audience but also questioning himself. In ancient Greek culture and literature, a ‘Nekyia’ is a ‘right by which ghosts were called up and questioned about the future’ but it’s also a concept used by philosopher C.G. Jung as part of his analytical psychology. For him the ‘Nekyia’ represents the introversion of the conscious mind into the deeper layers of the unconscious – or more simply put; a journey of restoration for the human psyche.